Lake Chelan Wine Valley is perfect spot for a getaway especially during our wonderful Washington summers. Check out the Come Visit Us section of http://www.lakechelanwinevalley.com/ for some good tips! Lake Chelan Wine Valley has a climate that is well-suited for growing grapes and boasts some very good up and coming wineries. Nefarious Cellars – my hands down favorite. Great wine. Great location. Great view of the lake. Perfect for sitting on the patio with a glass of wine. The winery tastes and sells not only what you might find in a store, but also some winery only and limited production wines. My favorite of the hard to find is the Rocky Mother. Oh my. Tsillan Cellars: A beautiful Tuscan Villa motif with a wonderful restaurant attached to the facilities – The Sorrento, is a great gathering place for you and your friends. The tasting room is very big and can accommodate larger groups at the same time. Tildio Winery, Manson: Nice wines, the winemaker Katy has been there since almost the beginning of wine production in the Lake Chelan AVA, a must if tasting on both sides of the lake. Cairdeas Winery, Manson – now this was a pleasant surprise. The entire line up was enjoyed and we walked away with a number of bottles. Small family winery with a nice atmosphere. Get there now before they start selling out as production is small. Karma Vineyards – Karma is a very nice place for lunch and a tasting. The tasting occurs at the table, with flights that are brought to the table. We splurged and tasted a couple flights each . For lunch, the summer salad and clams were enjoyed. The atmosphere is refreshing and takes you to a relaxing zen type vibe. The vineyards are located right there. Karma is often closed for wedding events, so check ahead of time if opened to public on day you’re there. Other wineries visited were Tunnel Hill Winery, Hard to Hoe Vineyards in Manson, and almost made it to Mellisoni Vineyards, but timing was such that it didn’t work as they are by appointment only. There are other wineries that were not visited, like the well-known Vin du lac which has a nice Bistro for lunch and overlooks the lake as well. Things to do on a hot summer day – Take a dip in the lake, rent a jet-ski, take a boat ride, walk around town, get a golf game in, try the water park, and more. I like Lake Chelan Wine Valley’s slogan…. “Naturally Intoxicating”. 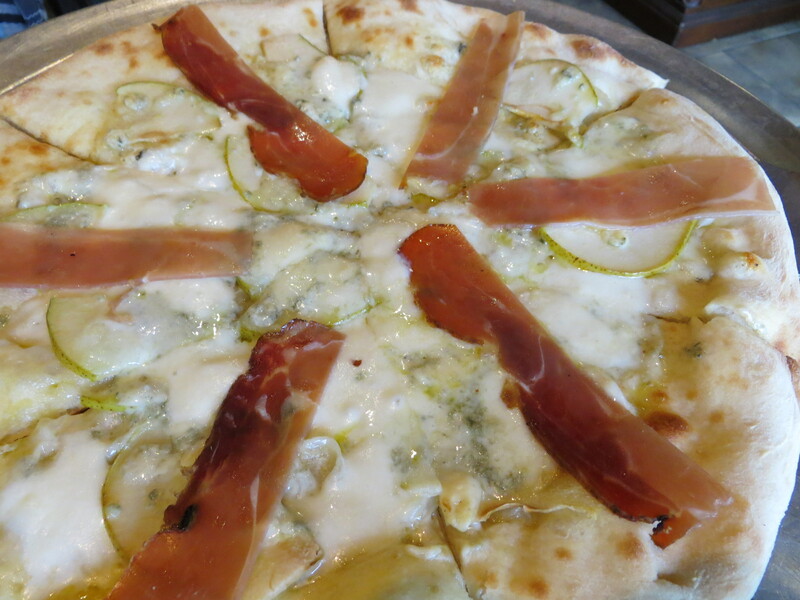 What types of artisanal pizza and other specialties do they have? Check out a sample menu on the website…you’ll get an idea. The mozzarella breadsticks are recommended and certainly you can’t stay (or take away) without having a pizza. They come in 12″ or 16″. Maybe you’ll go for a number of 12″ pizzas and take some home with you. Many of the ingredients are local and their mozzarella and ricotta cheese is homemade. Mmm Mmm Good. What pizza have I tried (on a number of occasions)? 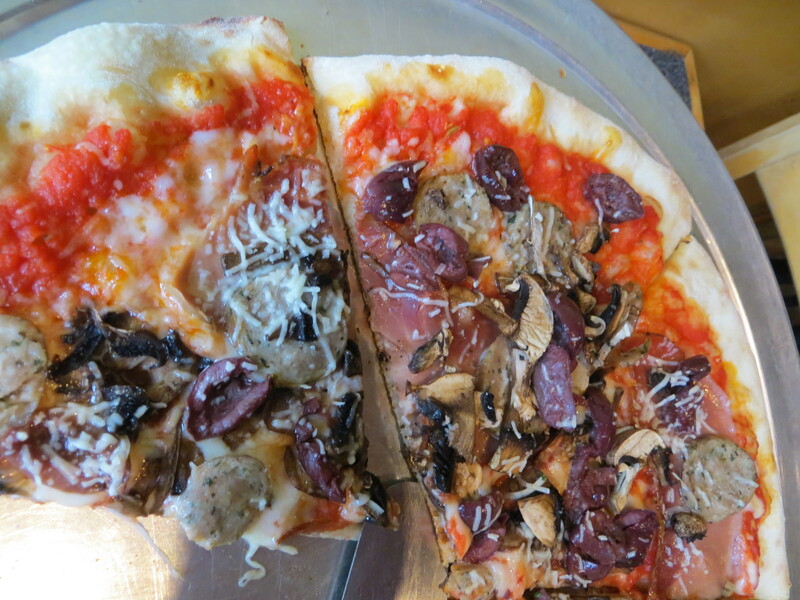 The DTR (Downtown Renton) – olive oil, prosciutto d’Parma, gorgonzola, mozzarella, pear, the Quattro Stagioni – San Marzano tomato sauce, Italian sausage, speck, mozzarella, Grana Padano, crimini mushroom, kalamata olive, and the Renton Theater – olive oil, speck, fontina, pecorino, crimini mushroom, caramelized onion. Do I have to pick a favorite? Wine, beer, and soft drinks are also available. And a sampling was had of their fresh squeezed blackberry lemonade which was a nice treat too. Here’s a “Rave” for the great service. I would expect there should be lines around the corner every night of the week for this treasure. You can dine in or carry out. They also use 2Go Services. It is rare that I want to sit down and get right to work on a posting, but this certainly did it for me. So, get off the couch and try it out!